People attend a dedication ceremony at the Jesse L. Acebedo Memorial Rest Stop. 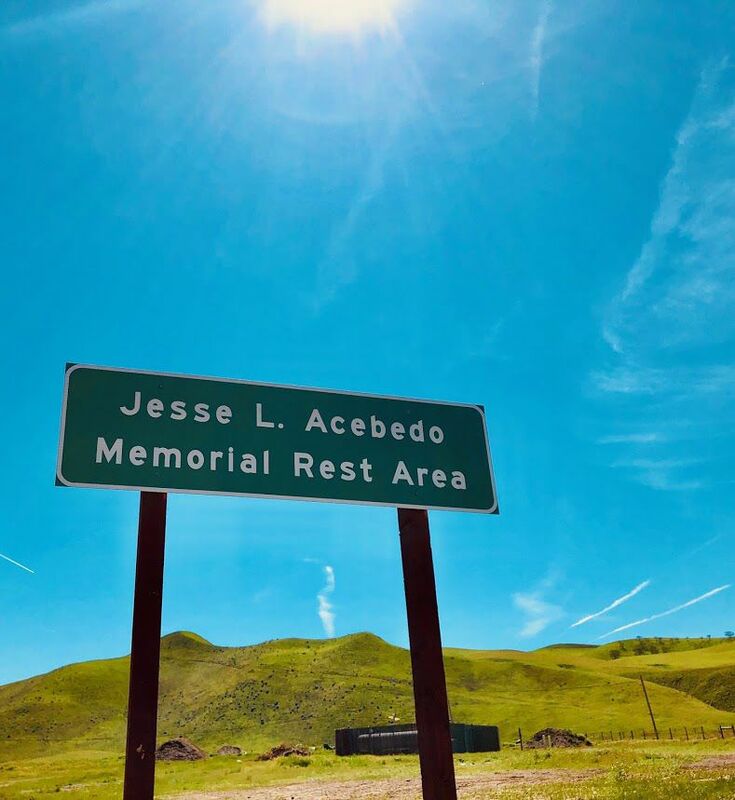 A rest stop near Shandon has been renamed the Jesse L. Acebedo Memorial Rest area after a Wasco man who died along the route. In this photo provided by the family, Jesse Acebedo, a retired Kern County Sheriff's deputy, sits with his grandson, Caden Acebedo. A rest stop along Highway 46 on the way to the Central Coast has become a place of remembrance and reflection for one Bakersfield family. “It’s a place that hold a very, very special meaning, and it’s going to be there forever,” said Jeff Acebedo, a Bakersfield resident and correctional counselor at Kern Valley State Prison. Acebedo’s father, Jesse Acebedo, was killed in a car accident on Highway 46 just over two years ago. Jesse, 68, was a retired Kern County Sheriff’s deputy and former member of the Kern County Board of Education. At 2:30 p.m. on March 31, 2017, he was driving west in a silver GMC Sierra on a two-lane stretch of road often nicknamed “Blood Alley” for the number of deadly collisions on it over the years. Just before Shandon, a community just west of Cholame, where the James Dean Memorial Junction is located, a semi-truck hauling a load of spent brewing grain drifted off the right side of the road and swerved into the oncoming westbound lane after overcorrecting. The truck clipped a Dodge Dakota before blowing a tire and hitting Jesse’s truck head-on. 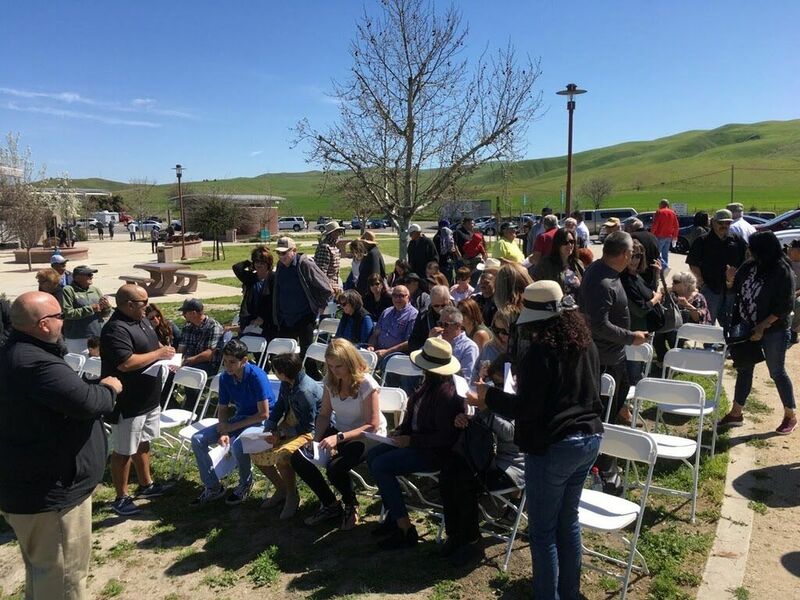 Now, two years after his death, the rest stop near where Jesse died has been renamed the “Jesse L. Acebedo Memorial Rest Area,” and the Kern County portion of the highway has either been widened from two lanes to four, or funding has been secured for such widening. The family recently held a dedication ceremony at the rest stop to remember Jesse and serve as a grand opening of the newly named area. Around 70 people showed up, the family said. “He touched a lot of lives in all the years that he was around,” Jesse’s wife, Raquel Acebedo said. She still lives part-time in Morro Bay. She and her husband had a house in Bakersfield and the seaside community, which they split their time between. She estimated they travelled the highway nearly three times a month. And she said she planned to continue shuttling between Bakersfield and Morro Bay to spend time in the cooler climate. The family has held a memorial golf tournament to honor Jesse for the past two years, and plans to hold a third in September. Proceeds from the golf tournament benefit the Kern County Student Leadership Program at Wasco Union High School, which Jesse started. Last year, the tournament raised enough money to provide $1,500 scholarships for two Wasco students. The tournament is part of the family’s efforts to keep Jesse’s legacy alive. An important part of that, for Acebedo, is the rest area. He plans to stop each time he makes the trip to Morro Bay. “My kids will be able to stop and take a moment, take a break, and think about ol’ grandpa,” he said.